1) Abisoye Ajayi-Akinfolarin, 33 - Social impact entrepreneur, Nigeria. 2) Esraa al-Shafei, 32 - Executive director of not for profit Majal.org., Bahrain. 3) Svetlana Alekseeva, 18 - Model, Russia. 4) Lizt Alfonso, 51 - Director and choreographer, Cuba. 5) Nimco Ali, 35 - Writer and activist, Somaliland. 6) Isabel Allende, 76 - Author, Peru. Isabel, who was born in Peru to Chilean parents, is the world's most widely read Spanish-language author and has sold more than 70 million books in 42 languages. 7) Boushra Yahya Almutawakel, 49 - Artist, photographer and activist, Yemen. 8) Alina Anisimova, 19 - Student programmer, Kyrgyzstan. Alina leads the Kyrgyz Girls' Space School, which aims to send the country's first satellite into space. 9) Frances Arnold, 62 - Professor of chemical engineering, bioengineering and biochemistry, US. 10) Uma Devi Badi, 54 - MP, Nepal. Uma is from the Badi community, which is considered "untouchable" in Nepal, and is working to change that perception. 11) Judith Balcazar, 65 - Retired fashion designer, UK. 12) Cindy Arlette Contreras Bautista, 28 - Lawyer, Peru. 13) Leyla Belyalova, 61 - University lecturer, Uzbekistan. Leyla is a university lecturer working to preserve Uzbekistan's mountain ecosystems and protect bird species, including raptors. 14) Analia Bortz, 51 - Doctor, rabbi and bioethicist, Argentina. 15) Fealofani Bruun, 35 - Yachtmaster, Samoa. 16) Raneen Bukhari, 31 - Curator and social media manager, Saudi Arabia. Raneen is a curator and art consultant, who also works for her family's design business. 17) Joy Buolamwini, 28 - AI artist/researcher, Canada. Joy is a 'poet of code', using art and research to illuminate the social implications of artificial intelligence. 18) Barbara Burton, 62 - CEO of BehindBras, UK. 19) Tamara Cheremnova, 62 - Author, Russia. Tamara lives with cerebral palsy, and writes fairy tales, earning her the nickname of "Storyteller of Siberia". 20) Chelsea Clinton, 38 - Vice-chair of the Clinton Foundation, US. 21) Stacey Cunningham, 44 - President, New York Stock Exchange (NYSE) Group, US. Stacey is the 67th president of the New York Stock Exchange, becoming the first woman to hold the position in the company's 226-year history. 22) Jenny Davidson, 50 - CEO of Stand Up Placer, US. 23) Asha de Vos, 39 - Marine biologist, Sri Lanka. 24) Gabriella Di Laccio, 44 - Soprano and founder of DONNE: Women in Music, Brazil. 25) Xiomara Diaz, 34 - Entrepreneur, restaurant owner and charity founder, Nicaragua. 26) Noma Dumezweni, 49 - Actor, eSwatini (formerly known as Swaziland). Noma is the first woman to play the adult version of Hermione Granger in Harry Potter and The Cursed Child, playing in London's West End and Broadway, New York. 27) Chidera Eggerue, 23 - Blogger - 'Slumflower', UK. Chidera is a best-selling author and activist behind the social media movement #saggyboobsmatter, driving new conversations about perceptions of women's bodies. 28) Shrouk El-Attar, 26 - Electronic design engineer, Egypt. 29) Nicole Evans, 44 - Online retail sales facilitator, UK. 30) Raghda Ezzeldin, 26 - Free-diver, Egypt. 31) Mitra Farazandeh, 42 - Artist, Iran. 32) Mamitu Gashe, 72 - Senior nurse aide/fistula surgeon, Ethiopia. 33) Meena Gayen, 36 - Business owner, India. 34) G.E.M., 27 - Singer-songwriter, China. 35) Fabiola Gianotti, 58 - Particle physicist, Italy. 36) Julia Gillard, 57 - Former Australian prime minister, UK. Julia was Australia's first female prime minister and now promotes education and leadership for women and girls. 37) Elena Gorolova, 49 - Social worker, Czech Republic. 38) Randi Heesoo Griffin, 30 - Olympic hockey player and data scientist, US. 39) Janet Harbick, 33 - Altruistic surrogate and tanning consultant, Canada. 40) Jessica Hayes, 41 - Teacher, US. Jessica is a consecrated virgin - vowing perpetual virginity as a bride of Christ - who teaches high-school theology classes and serves as a vocational adviser. 41) Thando Hopa, 29 - Model, lawyer, activist, South Africa. 42) Hindou Oumarou Ibrahim, 35 - Environmentalist and advocate for indigenous people and women, Chad. 43) Reyhan Jamalova, 16 - Student and entrepreneur, Azerbaijan. 44) Jameela Jamil, 32 - Actress, writer, activist, host, UK. Jameela currently stars in Mike Shur's critically acclaimed NBC series The Good Place. 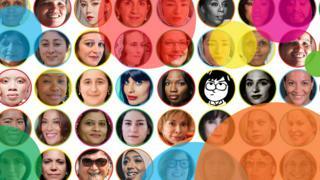 She launched the social media platform @i_Weigh, which calls on her followers to post about what they feel proud of. 45) Liz Johnson, 32 - Paralympian and entrepreneur, UK. 46) Lao Khang, 26 - Rugby player and coach, Laos. Lao led the Laos women's national rugby team to historic international victories, and is the first Hmong woman to earn her rugby coach licence. 47) Joey Mead King, 44 - Model, Philippines. Joey works as a model and presenter across Asia, and she and her partner Angelina Mead King appeared in a documentary which chronicled the couple's journey when Angelina came out as transgender. 48) Krishna Kumari, 40 - Politician, Pakistan. Krishna was elected to the Pakistan Senate after campaigning for women's rights, having previously been forced into bonded labour for three years. 49) Marie Laguerre, 22 - Civil engineer and architecture student, France. 50) Veasna Chea Leth, 44 - Lawyer, Cambodia. Veasna was the first woman to study law at Cambodia's Royal University of Law and Economics, and lived in a basement space beneath the college due to a lack of female dorms. 51) Ana Graciela Sagastume Lopez, 38 - Prosecutor, El Salvador. Ana was appointed head of a unit investigating cases of femicide in 2016 and earlier this year was named El Salvador's women and femicide special prosecutor co-ordinator. 52) Maria Corina Machado, 51 - Political leader, Venezuela. 53) Nanaia Mahuta, 48 - Minister of Maori development, New Zealand. 54) Sakdiyah Maruf, 36 - Stand-up comedian, Indonesia. Sakdiyah is Indonesia's first female Muslim stand-up and uses comedy as a way to challenge Islamic extremism and violence against women. 55) Lisa McGee, 38 - Writer, UK. Lisa is a Northern Irish playwright and the writer and creator of Derry Girls, Channel 4's most-watched comedy since 2004. 56) Kirsty McGurrell, 30 - Charity co-ordinator, UK. 57) Becki Meakin, 52 - General manager of Shaping Our Lives, UK. 58) Ruth Medufia, 27 - Metal worker, Ghana. 59) Larisa Mikhaltsova, 66 - Model and music teacher, Ukraine. 60) Amina J Mohammed, 57 - Deputy secretary general, United Nations, Nigeria. 61) Yanar Mohammed, 58 - President of the Organization of Women's Freedom in Iraq (OWFI), Iraq. 62) Joseline Esteffania Velasquez Morales, 26 - Student and NGO co-ordinator, Guatemala. 63) Robin Morgan, 77 - Author and activist, US. Robin has authored 20 books, and is a leader of the US women's movement and founder of The Sisterhood Is Global Institute and the Women's Media Center. 64) Nujeen Mustafa, 19 - Student, Syria. 65) Dima Nashawi, 38 - Artist, Syria. 66) Helena Ndume, 58 - Ophthalmologist, Namibia. Helena has performed sight-restoring surgeries upon 35,000 Namibians, free of charge - many of her patients now call her "Namibia's miracle doctor". 67) Kelly O'Dwyer, 41 - Member of Parliament, Australia. 68) Yuki Okoda, 23 - Astronomer, Japan. 69) Olivette Otele, 48 - Professor in History at Bath Spa University, Cameroon. 70) Claudia Sheinbaum Pardo, 56 - Mayor of Mexico City, Mexico. 71) Soo-yuen Park, 22 - Digital campaigner, South Korea. 72) Ophelia Pastrana, 36 - Comedian and media personality, Colombia. 73) Viji Palithodi, 50 - Activist, India. Viji set up a women's union, Penkootam, in Kerala and led the fight to get basic rights for women working as saleswomen - including the right to sit during working hours. 74) Brigitte Sossou Perenyi, 28 - Documentary producer, Ghana. Brigitte is an award-winning documentary producer, who told her story of being a Trokosi - a practice that sends girls to serve priests in shrines as payment for the "sins" of their family - and being trafficked from Togo to Ghana. 75) Vicky Phelan, 44 - Educational manager, Ireland. 76) Rahibi Soma Popere, 55 - Farmer and founder of the Seed Bank, India. 77) Valentina Quintero, 64 - Journalist, Venezuela. 78) Sam Ross, 30 - Catering assistant, UK. 79) Fatma Samoura, 56 - Fifa secretary general, Senegal. 80) Juliet Sargeant, 53 - Garden designer, Tanzania. Juliet is a doctor-turned-garden designer working to make "places that feel as good as they look". 81) Sima Sarkar, 44 - Full-time mother, Bangladesh. 82) Shaparak Shajarizadeh, 43 - Activist, Iran. 83) Haven Shepherd, 15 - Student and swimmer, Vietnam. 84) Nenney Shushaidah Binti Shamsuddin, 42 - Judge, Malaysia. 85) Hayat Sindi, [age undisclosed] - Chief scientific adviser to the president of the Islamic Development Bank, Saudi Arabia. Hayat is one of the world's leading biotechnologists, a Unesco goodwill ambassador for science, and founder of the i2 Institute for imagination and ingenuity. 86) Jacqueline Straub, 28 - Theologian, journalist and author, Germany. 87) Donna Strickland, 59 - Professor of physics, Canada. 88) Kanpassorn Suriyasangpetch, 30 - Dentist/tech entrepreneur, Thailand. 89) Setsuko Takamizawa, 90 - Retired, Japan. Setsuko is learning English to help guide tourists who will visit Tokyo for the city's 2020 Olympics. 90) Nargis Taraki, 21 - NGO legal adviser, Afghanistan. Nargis was her parents' fifth consecutive daughter and was almost exchanged for a boy; but her parents let her complete her education and she now campaigns for female empowerment. 91) Ellen Tejle, 34 - CEO at media house Fanzingo, Sweden. Ellen launched the global A-rate campaign, which raises awareness about women's representation in film. 92) Helen Taylor Thompson, 94 - Former spy and charity founder, UK. Helen was part of Prime Minister Winston Churchill's "secret army", sending coded messages to spies during World War Two, and went on to set up Europe's first Aids hospice. 93) Bola Tinubu, 51 - Lawyer, Nigeria. Bola is a corporate lawyer who established the first free children's helpline in Nigeria. 94) Errollyn Wallen, 60 - Composer, Belize. 95) Safiya Wazir, 27 - Community activist, Afghanistan. 96) Gladys West, 88 - Mathematician, USA. 97) Luo Yang, 34 - Photographer, China. 98) Maral Yazarloo-Pattrick, 37 - Fashion designer and motorcyclist, Iran. Maral is travelling the world on her motorbike, challenging Iran's ban on women riding motorbikes in public. 99) Tashi Zangmo, 55 - Executive director for the Bhutan Nuns Foundation, Bhutan. 100) Jing Zhao, 35 - Entrepreneur, China.